I’m not really a fan of sweet breakfasts. Don’t get me wrong – I love pancakes, but I’d just much rather have them after dinner as a dessert rather than first thing in the morning. The only sweet start to the day I can really fathom is toasted muesli with greek yoghurt and fruit (but the yoghurt can’t be the super sweet sort) even then, I usually eat muesli and yoghurt in the afternoon. For years I’ve been making an Italian inspired savoury French toast. It is basically bread dipped in my perfect italian scrambled eggs mixture (eggs, continental parsley, ricotta and romano cheese). Do yourself a favour and try putting ricotta in your next scrambled egg mixture – The addition of ricotta results in light fluffy and cloud like eggs. Just the way I like them. I never really cooked much as a young adult (why would you when your mother’s food was so spectacular) except on special family occasions like Mother’s Day and Father’s Day when all the kids would band together and cook breakfast for mum and dad. Being much younger than my brother and sister, the time quickly came where I was the only child left at home and had sole responsibility for breakfast. It was around this time that I decided to try out a savoury French toast by soaking a soft Italian loaf in my favourite scrambled egg mixture. It’s been one of the best breakfasts I have in my arsenal. 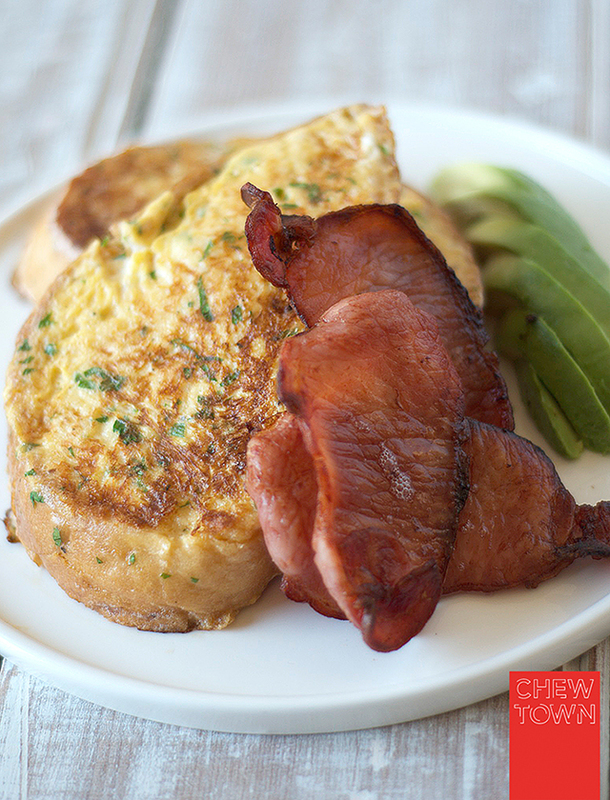 For some reason, savoury French toast really does surprise people and yet it is such a simple idea. I realised recently that while the blog has made me a much more competent cook, it has meant that there are some dishes in my history that I’ve never made Scott – my savoury French toast being one of them! Last weekend, I rectified this oversight and served these little babies up to Scotty as a surprise. Well, he loved them! He commented on the depth of flavour and how wonderful they tasted with the salty bacon and creamy avocado. If you haven’t tried your hand at savoury French toast – now is the time to give it a go! Crack eggs into a a large dish (one which will fit all four pieces of bread) and lightly whisk with a fork. Add ricotta and milk and mix well breaking up the ricotta as much as possible. Add romano cheese and parsley and mix well and add salt and pepper to taste. Place all four pieces of bread in the mixture and then immediately flip bread over. Leave bread to soak in the egg mixture for a few minutes. Preheat oven grill and then place bacon rashers underneath on a tray covered in alfoil. Flip bread over in the egg mixture so that the other side can soak for a few minutes. Heat butter in a large skillet and carefully transfer all bread pieces from the large dish to the hot skillet. Cook till the underside is golden and then flip. Once you have flipped the bread in the skillet, also flip the bacon under the grill. Cook the bread until the other side is also golden and the egg cooked through the bread. When the toast is ready the bacon should also be cooked. Serve two pieces of golden and fluffy savoury French toast with three rashers of bacon, half an avocado each, a morning espresso and the Sunday papers. Oh yea baby!!! Look at this!! I would love to start my Sunday morning like this! LOL…what is a 'rasher?" Is that an Aussie term? 😉 I'm not a sweet breakfast fan myself!! Always savory…sweets for dessert! Yes! I love savory takes on sweet breakfast foods too (and sweet takes on savory… like blueberry and maple filled breakfast sausages)! At work I always used to make myself some oatmeal, sprinkle with salt and lots of cracked pepper, drizzle with olive oil, and plop a soft-cooked egg on top. People always thought savory oatmeal was weird, but it's my favorite way to eat it. So, this is weird coincidence, but I just made french toast with bacon for dinner last night! I like to indulge Andrew with breakfast for dinner every once in awhile. I love how this version of yours is savory–what a great idea. I'm definitely going to try adding ricotta the next time I make scrambled eggs too. Well I know what I'll be adding to my eggs next time I make a scramble. This sounds delicious! Amanda, I'm totally with you. If I had my pick between savory and sweet breakfast items – I'd go for the savory first. Always! I have been thinking about making savory French Toast – so thanks for posting this. You must have read my mind! I had no idea you didn't call them 'rashers' in the US! It's a British term that we have adopted in Australia. Rashers are basically just another word for slices! Oh wow… I love the sound of those blueberry and maple filled breakfast sausages (hope you have them on your blog!). The soft boiled egg on oatmeal sounds awesome too. Super-weird coincidence!! Definitely a sign you must make them soon 🙂 P.S. More photos of your cute pooches please!! Next time you try it, let me know what you think! I must have read your mind! haha. I am glad so many people prefer savoury for breakfast – we are all kindred spirits! Good to know. 🙂 Rashers sounds cooler anyway! I have had savoury French Toast but it's been ages. And I'm with you – sweet stuff for breakfast just doesn't cut it. Delish dish – thanks so much. French Toast always triggers memories of having breakfast in bed as a child. I suffered from severe asthma and french toast was my sicky treat from Mum. yay for mums! When I saw the photo above my mouth started watering. Looks like an awesome breakfast meal!